New primetime episodes of Restaurant Impossible, Chopped, Chopped Canada, Beat Bobby Flay, Cutthroat Kitchen, Mystery Diners, Save My Bakery, and Diners, Drive-Ins and Dives. NEW YORK – March 5, 2014 – Food Network springs into April with new primetime series, Kitchen Casino, premiering Monday, April 7th at 9pm with host Bill Rancic, in which the stakes are raised to see who can make the best meals under pressure in three casino-themed challenges. Then, the most talented home cooks from across the country compete with the help of mentors Cat Cora, Tyler Florence, Alex Guarnaschelli, and Michael Symon in America’s Best Cook, hosted by Ted Allen, premiering Sunday, April 13th at 9pm. Also in primetime, America’s favorite snack foods get transformed under the watchful eye of host Joey Fatone with the premiere of Rewrapped on Monday, April 21st at 8pm, where the country’s top chefs attempt to recreate and reinvent the nation’s most popular treats. Premiering Sunday, April 6th at 9pm, the Chopped Tournament of Stars comes to an exhilarating finish as the top celebrities from the first four episodes duke it out in the finale to see who will take home the big prize for their charity. Rounding out April are premiere episodes of Chopped, Cutthroat Kitchen, Food Court Wars and Restaurant: Impossible, while Farmhouse Rules and The Kitchen return in daytime. FoodNetwork.com is your go-to for spring recipes and tips. Join the Food Network conversation on Facebook and Twitter. Hosted by Bill Rancic, Kitchen Casino ups the ante of cooking competitions, bringing together four talented chefs in a high-stakes game of chance that is all about skill, speed and adaptability. With one eye on the ticking clock, competitors have to out-cook and out-smart their competition in three casino-themed challenges — slots, poker and roulette — for a chance to win a $30,000 jackpot. These chefs working at the top of their game need to be able to make magic with whatever Lady Luck puts in front of them and have to double-down on their skills or risk being 86′d. Place your bets! Iconic snack foods are transformed in Rewrapped, a new competition series hosted by Joey Fatone, in which three competitors use their talents to recreate and innovate America’s most beloved snacks. First, the challengers attempt to duplicate the original item from scratch. Then it is onto the second round, where they must use the snack food in a completely original dish. Led by head judge Marc Summers and a panel of expert judges, only one can be crowned the Rewrapped champ! Visit http://www.foodnetwork.com/Chopped for exclusive exit interviews with the celebrity contestants and follow the battles on Twitter using #Chopped. America’s top home cooks take center stage in this high-stakes competition hosted by Ted Allen. There will be blood, sweat and tears as these talented cooks are pushed to their limit in a battle for the grand prize of $50,000 and the title of America’s Best Cook. 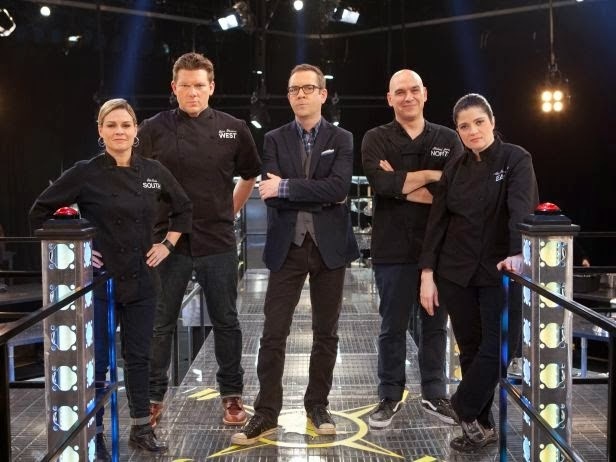 But they will not be going into this competition alone: Four of Food Network’s biggest stars — Michael Symon, Alex Guarnaschelli, Cat Cora and Tyler Florence — choose their teams and mentor their home cooks with their eye on the prize. Sixteen of America’s Best Cooks arrive at Food Network for the chance to compete for $50,000 and the title of America’s Best Cook. Hosted by Ted Allen, the cooks are divided into teams which are mentored by Cat Cora, Tyler Florence, Alex Guarnaschelli and Michael Symon, each representing the South, West, East and North respectively. The series kicks off with a timed culinary challenge where the cooks, divided into groups of four, compete for coveted positions on the mentor’s teams. Following the challenge, each mentor tastes the dishes of four hopeful cooks and chooses the two for their team that they believe will lead them to victory. The mentors guide their cooks through the next five weeks of competition and if f their cooks go home, so do they. With each of the teams in place, the competition gets underway. The cooks, under the guidance of their mentors compete in two challenges. In the first challenge, the cooks have 30 minutes to elevate kitchen classics like tacos, mac and cheese, spaghetti and meatballs, chili, tuna casserole, and sloppy joes. They are critiqued by the first guest judge, Anne Burrell, who decides who must compete in the dreaded Pressure Cooker round and face possible elimination. For the Pressure Cooker, the cooks must turn a plain chicken breast into an impressive dish. One cook is sent home and their mentor is one step closer to elimination. The remaining seven cooks are faced with a sweet dessert challenge. “Sweet Genius” Ron Ben-Israel joins as guest judge and challenges the cooks to make a traditionally savory dish into a sweet dessert using bacon as the featured ingredient. The mentors give advice on how to incorporate the ingredient the best way possible as Ron determines which four cooks must compete in the Pressure Cooker round. The bottom four cooks must make a dessert using the infamous pairing of peanut butter and jelly. Following the round, another mentor loses a team member and is one step closer to elimination. It is a battle of the wings in round one as the chefs jockey for a spot at the fryer, and one chef’s chicken is well underdone. There is a lot at stake when three chefs try to combine a traditional Japanese vegetable with a classic childhood snack. An ambitious dessert effort impresses the judges, but will it hold up? Four chefs dig deep to fight the dragon as an exotic fruit rears its head in the appetizer round. Things get a bit fishy as the chefs are handed a sweet, cheesy basket for the entree round. One chef chooses rhyme over reason as he boozes it up, while another leaves his beer on ice for the final showdown. It is a scrambled start as the chefs flame out over sirloin and spirits. The entree round becomes a turkey shoot as the remaining chefs go bananas to make it to the final battle. One chef melts down as they noodle things over for the $10,000 prize. Cod tongues cause conniptions as three earnest chefs struggle to defeat a cocky contender who promises to quit cooking forever if he doesn’t take home the Chopped Canada prize. In the dinner round, Calves Liver and Cupcakes are a pairing for despairing. It is a battle to the finish as both chefs choose choux pastry as a foil for a cheese-filled dessert. Catering queen Kimberly Van Kline and the king of his own culinary castle, Christopher Lee, compete for the royal jewel — a chance to take on Bobby Flay! Iron Chef Alex Guarnaschelli and down-home chef Jack McDavid stop by to see how the competition measures up. Will these chefs have what it takes to Beat Bobby Flay? It is old school versus new school as experienced chef Andrew Evans battles the up-and-coming chef Brooke Mallory for the chance to Beat Bobby Flay. Here to spice things up are Chopped judge Scott Conant and co-host of The Kitchen Katie Lee. Who will get the chance to go up against Bobby and who will go home? In the first basket, the fryer gets pretty crowded as the chefs race to make crispy chicken wings, and the chefs are challenged to make African peri peri rub work in their dishes. Then in the entree round, a difficult cut of meat and a salty sandwich spread challenge the remaining chefs. A surprising final ingredient in the dessert round will be the final test to determine the Chopped Champion. There are mixed reactions from the chefs when they learn that they will be competing with three baskets of leftovers. When time starts in the first round, the chefs frantically dig in to takeout containers from various types of restaurants. Then in the entree round, forgotten packets of hot sauce find their way in to the basket and one chef realizes a critical error too late. Leftover bacon in the final basket leads to a sizzling dessert round. Do not miss Chopped After Hours, a web series on FoodNetwork.com, where the Chopped judges step out from behind the chopping block to put their own spin on some of Chopped’s toughest and strangest baskets. Two chefs get up close and personal while making pea soup. One chef must come up with innovative uses for lamb shears when forced to use them instead of knives, and a chef’s whisk gets supersized for chocolate mousse. One chef is forced to serve a hot version of Cobb salad. Then, someone must build their own kitchen from random items inside of a shopping cart, while another chef gets down-and-dirty when they are forced to make layer cake with a cement mixer. One chef is skating on thin ice when their knives are replaced with a hockey skate. Next, a chef is in a bind when their fingers get trapped while cooking General Tso’s chicken. Finally, one chef finds new uses for gardening tools to create their best carrot cake. Things get evil when a chef must tediously separate grains of rice to make risotto. A chef’s patience is tested as they wait, and wait and wait for their number to be called at the Cutthroat Kitchen Deli. And revenge is best served cold when one chef must chisel their ingredients from a block of ice. This trip, Guy’s getting into a festival of flavorful favorites. In Miami, Fla., the local watering hole puts a unique spin on standard bar food with a loaded chimi burrito and lobster lollipops. In Sandy, Utah, a mountain town favorite makes everything from breads to smoked meats to creative combos like Canadian bacon and potato croquettes. In Salt Lake City, a New Jersey native serves up authentic Italian family recipes like the larger-than-life ten ounce meatball. Friends JB and Brandi are looking to expand their catering business in hopes that the success will provide validation for the sacrifices they have made for their dream. Father-daughter team Thomas and Stephanie hope their strong bond and love of Southern cooking will make their restaurant a successful family venture for years to come. Only one of these teams will come out on top as they compete to win their own food court restaurant in Bossier City, Louisiana. Friends and co-workers Randy and Brandon are ready to bring Randy’s family-run submarine sandwich food truck to the food court. Close friends Michelle and Lindsey love home-cooked comfort foods and after Michelle was forced to close her bakery, she has dreamed of returning to the culinary world. Both teams bring their big dreams to be realized in a mall in Logan, Utah. Brothers Michael and Lem dream of bringing their burgers to the food court, and to the stability the business could bring to both their families. Ayanna and Dee are best friends and former military brats who run catering companies in Memphis. They have a love for international cuisine that they want to share with their customers. Both teams fight it out for a spot in a Jonesboro, Ark., food court. When Chris, owner of Spring Street Smoke House in Los Angeles, notices a decrease in his valuable fat trimmings, he contacts Charles for help. Mystery Diners Amber and Grant go undercover to discover the meat of the problem. After noticing excess lobster meat and an increase in mileage, Peter, owner of the Roll’n Lobster Food Truck in Los Angeles believes his new drivers are using his vehicle for personal errands. Charles sends in Mystery Diners Shelby and John to crack the case. Robert heads to Houston, Texas, to help revive Gratifi Kitchen + Bar, where the owner is hemorrhaging money and the employees bicker with owner Kevin, who has invested nearly one million dollars in the restaurant. The kitchen is a disaster and Kevin’s sarcastic personality is rubbing both the employees and Robert the wrong way, putting Kevin’s lifelong dream for owning a restaurant at risk. Robert has just 48 hours to get Kevin on the same page with his staff and get Gratifi on the path to success! Chef Robert Irvine travels to Oklahoma City and discovers Urban Roots, a restaurant and music venue that is not pulling its weight. Despite a great location, a building with amazing character and owners who are trained professionals, the restaurant is understaffed and the food is not up to owners Chaya and Michael’s standards. Can Robert help Chaya, a trained chef, get the most out of her talent and help bring the couple out of debt in 48 hours? If not, Urban Roots just might have to face the music. When Robert arrives in Hueytown, Ala., the first thing he notices at Bryant’s Seafood World is the rancid stench of stale grease and grime covering everything. It’s up to him to fix one of the beloved local staples and get owner Gail to stomach the criticism and change Bryant’s back to the way it used to be. The hushpuppies will be flying when Robert and Gail argue over the direction of the restaurant. Robert has just two days to show Gail that his changes can help put Bryant’s back on the Alabama food map! Turning around a failing restaurant is a daunting challenge under the best of circumstances. Attempting to do it in just two days with only $10,000 may be impossible. But Chef Robert Irvine is ready to take on the challenge. He’ll use a little MacGyver and a lot of muscle to rescue these desperate places from complete collapse. Can one man, in two days, with just $10,000, turn the tide of a failing restaurant, and pave the road to a successful future? Find out as Robert takes on Restaurant: Impossible. Family-owned bakeries used to occupy a vital place on Main Streets everywhere, but these days, they are more often run-down than thriving. Enter renowned cake maestro Kerry Vincent, who answers the desperate call of bakery owners in over their heads. Armed with a spot of tea and a no-nonsense approach, Kerry gives each place a makeover from the inside out, turning stale pastries into delectable deserts and outdated decor into a brand-new, inviting space … but most importantly, transforming the families who have kept these businesses open. Nancy visits her favorite antique shops looking for fun old kitchen gadgets. She uses her fantastic finds to make a meal of Chile Braised Ribs, Stove Top Mac and Cheese, Baked Cinnamon Sugar Madeleines and Irish Coffee. Nancy and David are having David’s brother and wife over for dinner and games. Nancy heads to a local wine shop to pick out bottles to complement their meal of Beef Wellington, Roasted Beet Salad With Walnuts and Goat Cheese, Easy Baked Alaska and White Wine Sangria. It’s the perfect meal to fuel their game of charades! You have seen Guy Fieri travel the country tasting incredibly unique dishes. Guy never forgot his first Brunswick Stew, and you may never forget Guy’s version once you taste this smoky, savory bacon and chicken stew. Guy cooks up spicy Poblano-Stuffed Cornbread and a tart Green Apple Slaw. For Guy Fieri, hot dogs are pure family comfort. A staple at ball parks and family cookouts, Guy likes his with coleslaw and apple pie. And you know he does all three with an outta bounds, Guy-style twist! We are talking bacon-wrapped Danger Dogs With Grilled Fruit and Spicy Fruit Relish, Creamy Broccoli Fennel Slaw and a Moonshine Apple Pie Cocktail. You have heard of Flavortown, and you have heard of Funky Town, but have you heard of Funky Fungo Town? Today Guy Fieri takes you there with flavors of Puerto Rico, including a Roasted Puerto Rican Pork Shoulder, Guy’s Funky Mofongo With Sopa de Pollo — a fried plantain dish with pork cracklings and bacon, served topped with warm chicken broth. On the side, Kale Salad With Mango Vinaigrette. It’s a trip to Funky Fungo Town, and you don’t even need to leave the house! Guy Fieri knows sometimes the best part of the meal is the appetizers. So join him as he makes Buffalo Chicken Nachos, with Blue Cheese Sauce and all the fixings. Next up, Bangin’ Blue Olives With Prosciutto. To drink? It’s gotta be a Bloody Beer — think Bloody Mary with beer and tequila in place of the vodka. You’re gonna dig this menu! Join Rachael Ray as she makes five make-ahead meals in one day — and the best part is that they each cook up in 30 minutes or less! First up is a Sausage Ragu With Pappardelle, then for dish two, how about a nice bowl of homemade Mushroom Soup With Marsala, served over a round of fried toast and grated Parmigiano-Reggiano? Dish three is Zucchini Potato and Fennel Stew, dish four is Chicken Thighs in Mild Red Curry, and for dish five, it is Turkey and Chorizo Chili, topped with crushed corn chips. Rachael Ray makes five 30 minute make-ahead meals, including Beef Goulash with Blue Cheese, Toasted Spaghetti Minestra with Tuscan Kale, Sweet Sausage and Eggplant Penne, Boneless Chicken Chasseur, and Tomato Soup and Pumpernickel Grilled Cheese. That is five make-ahead meals, up to a week’s worth of food, done …in just one day! The only thing better than a meal that saves time is a meal that saves money, and Rachael Ray is here to show you a week’s worth of meals that do both! It’s It is five budget-friendly dishes that you can make in a single day! Dish one is Parsnip and Potato Soup, dish two is Baked Beans and Knockwurst. For dish three, it is Bean Ragu with Linguini, dish four is a killer Chicken and Green Bean Soup with Tarragon and dish five is Croque Monsieur Pie, a bubbly cheesy casserole not to be missed! Buying food, especially meats, in bulk can be a great deal; but once you buy it, you have to use it! Rachael Ray is getting two different but equally delicious meals out of pork shoulder, and two more out of chicken thighs, plus a tasty meat-free menu to lighten things up midweek. Recipes include Hungarian Pork One Pot, Pork and Cider Stew, Broken Spaghetti Soup with Escarole, Green Harissa Chicken Thighs and Chicken with Porcini Gravy and Polenta. Giada makes a very traditional Italian Easter luncheon for her family using the fresh flavors of Italy. The menu features Italian Springtime Lamb, Artichoke Risotto and Whipped Ricotta Salad. Host Giada De Laurentiis makes Spicy Citrus Popcorn to snack on in the kitchen, and then Aunt Raffy shows up and teaches Giada one of her favorite recipes, Quinoa and Ceci Soup. Giada sweetens things up with her Peanut Butter Espresso Brownies recipe. Amy’s cousin Matt is the fourth generation to run Thielen Meats in Pierz, Minn. Today he is paying a visit to Amy with his daughter, Addie, and joining for a rustic Pork Meatloaf with Cabbage and Prunes, a lively Lemony Parsley Salad and a treat from the recipe files of their grandmother, an old-fashioned Macerated Apple Pie with Leaf Lard Crust. In this episode, Amy’s kitchen spins out a traditional nostalgic supper club meal, with a few updates: Steakhouse Deviled Egg, Rib Eye with Teddy’s Homemade Steak Sauce and Glorified Hash Brown Cake with Frying Peppers. Online at www.foodnetwork.com/TheKitchen, check out exciting updates, including recipes from the show, behind-the-scenes photos and fun facts from the culinary department. On the FN Dish blog, get one post each week written by one of the hosts, plus special giveaways. While the kids and Ladd are outside working the bulls, Ree is making them a rib-sticking meal for when the school bell rings. There is Strawberry Lemonade to refresh them when they get to the lodge, and then Scalloped Potatoes and Ham with a side of Lemony Green Beans. To keep things sweet, Ree dishes up Chocolate Pecan Crispy Treats before the kids get down to their studies. The whole family is pitching in for a big party to celebrate Ree’s father-in-law, Chuck’s, birthday. Everyone is gathering at the lodge for a Cajun Surf and Turf feast, with rare beef tenderloin and juicy jumbo shrimp, and Cajun Mashed Potatoes and Garlic Butter Dinner Rolls on the side. The girls help Ree make a delicious Strawberry Shortcake Cake. It is one birthday Chuck will never forget. Damaris’s niece and friends are visiting, so she whips up foods that kids love with sneaky tricks to get them to eat their veggies. They make Semolina and Sundried Tomato Waffles with Homemade Pizza Sauce and Chocolate Chip Cherry Cast-Iron Cookies. With simple, sure-fire recipes, Damaris shows how to make special meals for the little loved ones in your family. Damaris helps her kitchen-challenged Uncle John tackle the traditional Phillips spring lamb feast. Taking the intimidation out of preparing a large roast, Damaris demonstrates an easy cooking method and simply layers fresh flavors to bring out the best qualities of Roasted Lamb and Mint Chimichurri. Feta-Roasted New Potatoes and Togarashi-Glazed Carrots round out this crowd-pleasing menu that shows a fresh take on traditional Southern fare. Damaris brings the flavors of New Orleans home. When her brother sends a care package of Tasso ham from New Orleans, Damaris creates an inspired menu to satisfy her Louisiana cravings. With simple techniques, she whips up a flavorful Maque Choux with Tasso Ham. Her foolproof olive tapenade transforms an ordinary cold cut sandwich into a signature Muffaletta and for a sweet finish, a decadent Bananas Foster Bread. Damaris takes on her hometown’s grand event with her own version of a proper Derby party. With her fancy hat at the ready, she kicks off the festivities with a classic Kentucky dish: Hot Browns with Pimento Cheese Mornay. She pulls into the lead with a refreshing Mint Julep and it is an easy win with her spectacular Chocolate Bourbon Pecan Pie. Damaris gives you all the tips and tricks you will need to make your Derby party a photo finish! From Spring Lamb to an Easter Ham, Join Food Network for a Spring Feast of fresh recipes for the season, including premiere episodes from Giada at Home, Guy’s Big Bite, Heartland Table, The Pioneer Woman, Rachael Ray’s Week in a Day and Southern at Heart. Five Weeknight Dinners: Spring Find our best recipes for quick and easy weeknight meals, made with favorite spring ingredients like asparagus, artichokes and carrots, paired with mealtime staples like chicken, shrimp, salmon and pasta. Spring vegetables are finally in season! Cook with peas, asparagus, spring onions, strawberries, rhubarb, broccoli and carrots with fresh-produce focused recipes. Find everything you need for spring cooking and entertaining in our spring hub. Here, you can easily access all of our spring packages (Spring Produce Guide, 5 Weeknight Dinners: Spring and Spring Entertaining Guide), plus Mother’s Day, Easter and Everyday Celebrations. Celebrate Easter with classic recipes like Alton’s Carrot Cake, Trisha’s Strawberry Salad, Ina’s Orange Baked Ham, Food Network Kitchen’s lamb chop or roasted salmon and Giada’s Asparagus Frittata, and find new recipes to try this year, such as little lamb cupcakes, Easter-chick macaroons, creamy spring peas, smoked salmon deviled eggs and a giant Easter egg cookie cake, plus learn how to make perfect hard-boiled eggs, egg salad and deviled eggs. Dinner needn’t suffer just because there’s no time to shop. Whip up fantastic meals using what you have at home with pantry-raid recipes like easy minestrone, applesauce waffles, chili and s’mores bark. And the next time you are at the store, learn what to stock up on for easy cooking with our pantry checklist. Get dinner on the table in a flash with our timesaving recipes. Rely on shortcut ingredients like rotisserie chicken, frozen pie crust, canned beans, frozen vegetables, instant pudding and store-bought tomato sauce to make homemade meals in half the time. FOOD NETWORK (www.foodnetwork.com) is a unique lifestyle network, website and magazine that connects viewers to the power and joy of food. The network strives to be viewers’ best friend in food and is committed to leading by teaching, inspiring, empowering and entertaining through its talent and expertise. Food Network is distributed to more than 100 million U.S. households and averages more than 9.9 million unique web users monthly. Since launching in 2009, Food Network Magazine’s rate base has grown tenfold and is now the second largest monthly magazine on the newsstand, with over 11.6 million readers. Headquartered in New York, Food Network has a growing international presence with programming in more than 150 countries, including 24-hour networks in the United Kingdom, Asia, and the Europe, Middle East and Africa (EMEA) region. Scripps Networks Interactive (NYSE: SNI), which also owns and operates Cooking Channel (www.cookingchanneltv.com), HGTV (www.hgtv.com), DIY Network (www.diynetwork.com), Travel Channel (www.travelchannel.com) and Great American Country (www.gactv.com), is the manager and general partner. America's Best Cook looks interesting. I'm going to give that one a shot. Could they please turn down the volume on Sunny Anderson? Her voice booms every time she opens her mouth that she drowns out the monotonous Katie Lee (how is that possible?). We get that KL and SA don't like Jeff Mauro -- but he's got his own show on the Network and a degree as a chef (something neither of them has) so he must be doing something right. His piece with Martha Stewart was probably the best of the entire episode. This show is horrible! Jeffery should wear jackets that fit! (But, at least he lost the '80s glasses).I agree with most others, Jeff is too clown-like and Katie Lee is an idiot. Then again it seems as if FN is putting anything on air lately. I rarely watch it anymore, it ranks right up there with 'The Weather Channel'. A show with just Sunny and Geoffrey would be lovely. The other three make my skin crawl. The only true food stars I believe that FN has anymore in terms of really knowing food, the food business and being fun to watch, listen to and learn from are Geoffrey, Bobby and Ina. The rest have all been reduced to being silly game show hosts. Alton and so many others jumped the shark long ago, but Alton's fall has been the farthest I think. Good grief!